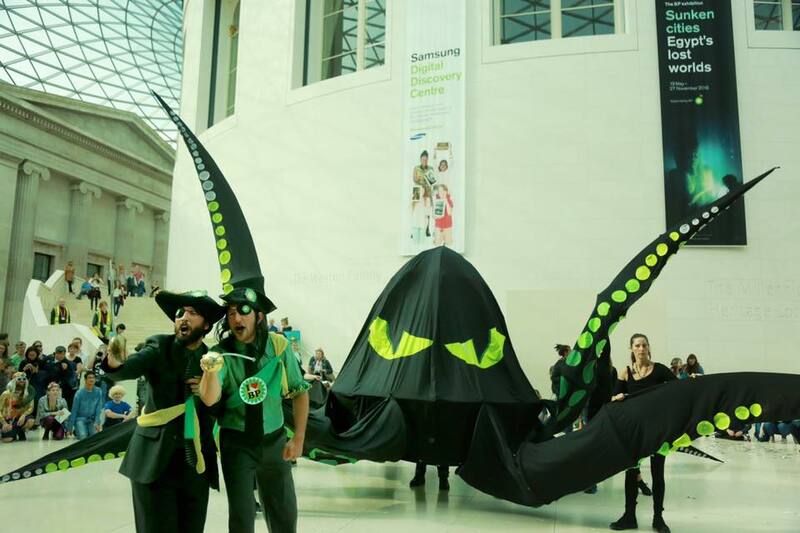 This weekend the British Museum found itself invaded by merfolk, pirates and a giant creature from the deep as part of an elaborate protest against its newly renewed sponsorship deal with BP. Organised by the collective BP or not BP, who have staged 36 public performances protesting BP sponsorship of cultural institutions, the ‘splashmob’ saw hundreds of people decked out in blue, forming a living, breathing ocean fighting back against one of the worst climate criminals. I was part of that ocean, and although my costume only extended so far as a bit of blue glitter on my face, there was plenty for us to get stuck into; variously providing a soundtrack of seagulls, waves, whales – and that was before things got really interesting. I’ve been on my fair share of protests by now and this was easily the most fun. Merfolk singing new versions of Under the Sea and It’s Raining Oil, a rousing sea shanty ‘What shall we do with the oil sponsor’, and yes, a giant multi-limbed BP kraken operated by eight puppeteers – how they got that through security I’ll never know. If more campaigning could be this bold, creative and joyful, maybe it wouldn’t be so hard to inspire people to take action. Oil profiteering is serious business, and we are right to be aghast at the legitimacy that BP gets as part of its association with cultural establishments. The irony of BP sponsoring an exhibition about Sunken Cities would be hilarious if it weren’t so sickening. But by making our point in a way that is so good-humoured and good-hearted, we increase our impact. This seems to me to be a great first foray into direct action for many people. It’s exciting and it feels transgressive passing through security, eyeing up other people in the queue, trying to work out if they’re in on it or if they just happen to be wearing a shark dress anyway. But it’s also a very safe environment, family friendly, and the staff were very accommodating and good-natured about the whole thing. I left inspired, energised and looking forward to the next piece of protest theatre!